1. 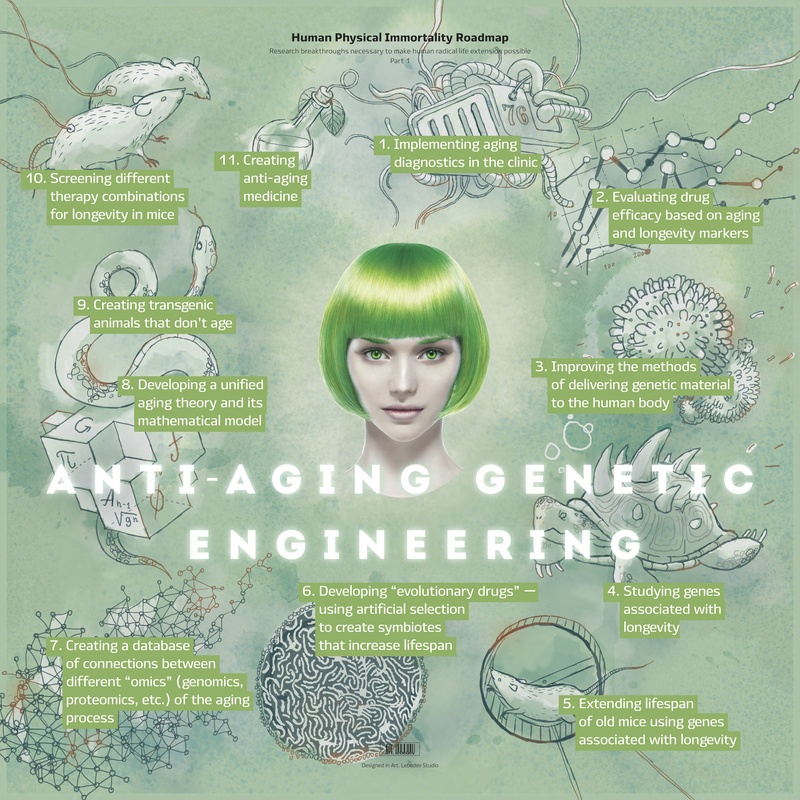 Anti-Aging through Genetic Engineering is probably the one we’re going to figure out first as we already have some really smart people working on the problem, like Audrey DeGrey from SNES. The idea here is to look at what causes biological aging, and figure out solutions to optimize those systems. We know this is possible because animals with negligible senescence exist, like lobsters, who die from old age. A lobsters ability to reproduce, and it’s internal functions don’t decrease as it ages. Lobsters can’t die of old age, aka practically immortal. In humans we have a good idea of where aging comes from – not to oversimplify the problem, but telomeres seem to be the bottleneck in human aging. When our telomeres run out, our cells can’t divide anymore, our organs begin to deteriorate until something breaks which takes out the rest of the system. 2. 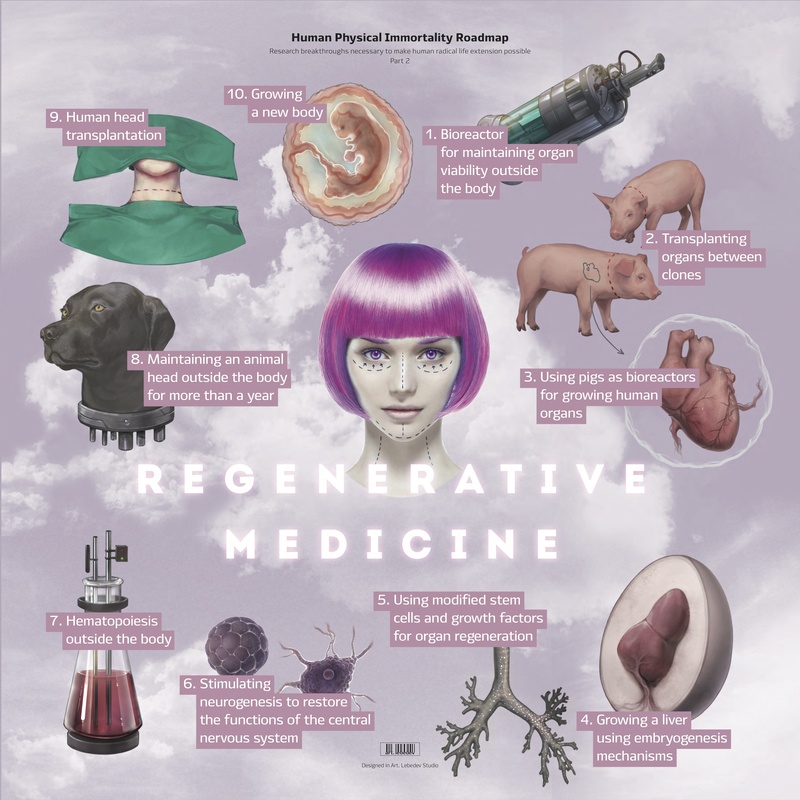 Regenerative Medicine is also very interesting and something we’re already doing at a basic level today. I think 3d printing organs would fall under this category — we can print livers, ears, skin cells, etc. Soon we’ll be implanting these synthetic/organic organs into humans instead of testing on other animals. If you need a new kidney of a certain type, instead of needing a donor kidney, you could get one printed with the correct stem cells. 3. 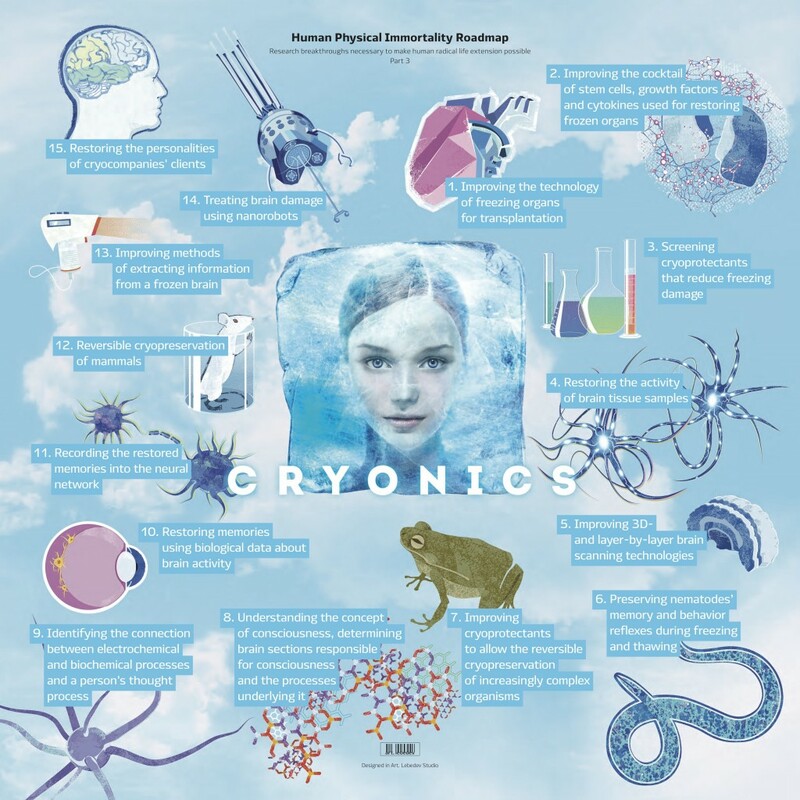 Cryonics is basically the idea that you can freeze your human body just after ‘death’, delaying the decay of the body and tissue. The hope is in the far future we’ll be able to build systems to ‘fix’ whatever caused your death. 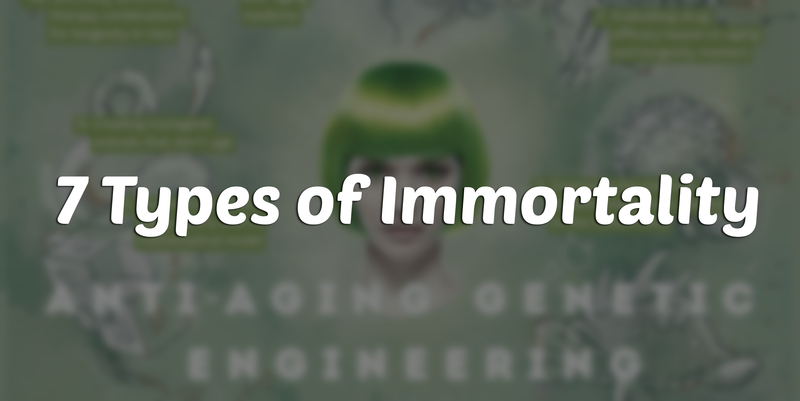 By preserving your current meat-body, you’re basically buying yourself some time to see if we can figure out immortality in 10, 100, 1000 years. 4. 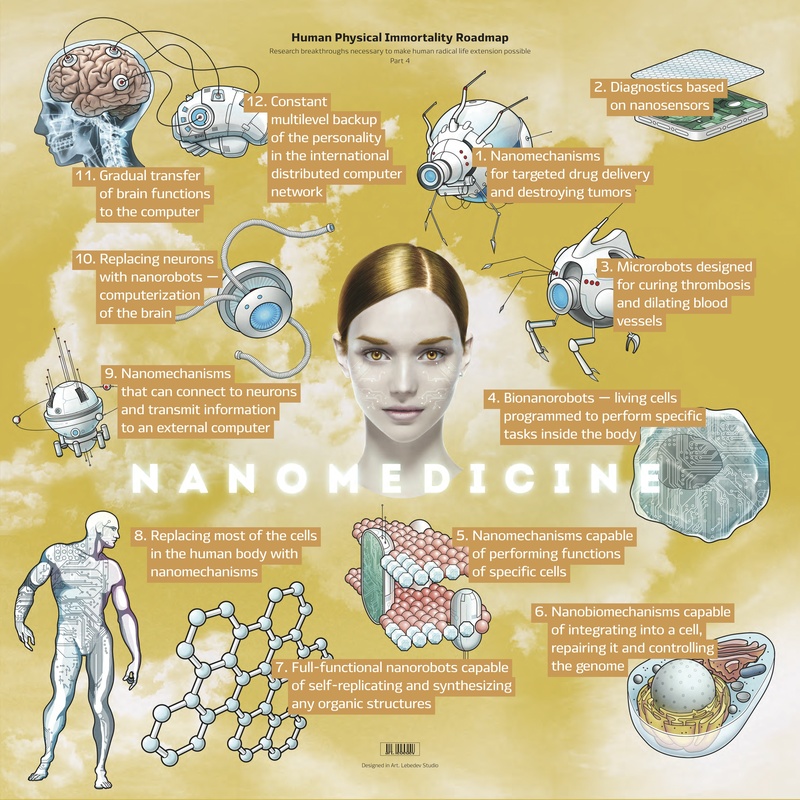 Nanomedicine deals with nanoscale robots which act as supplements to our existing biological systems. They can deliver medicine, fix broken bones, fight cancer, and even model our brain structure in hopes of being able to re-create it. 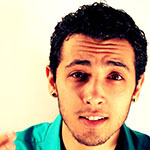 If / when we nail nano-medicine, we’re going to have nano-everything, and that will be a really interesting time. 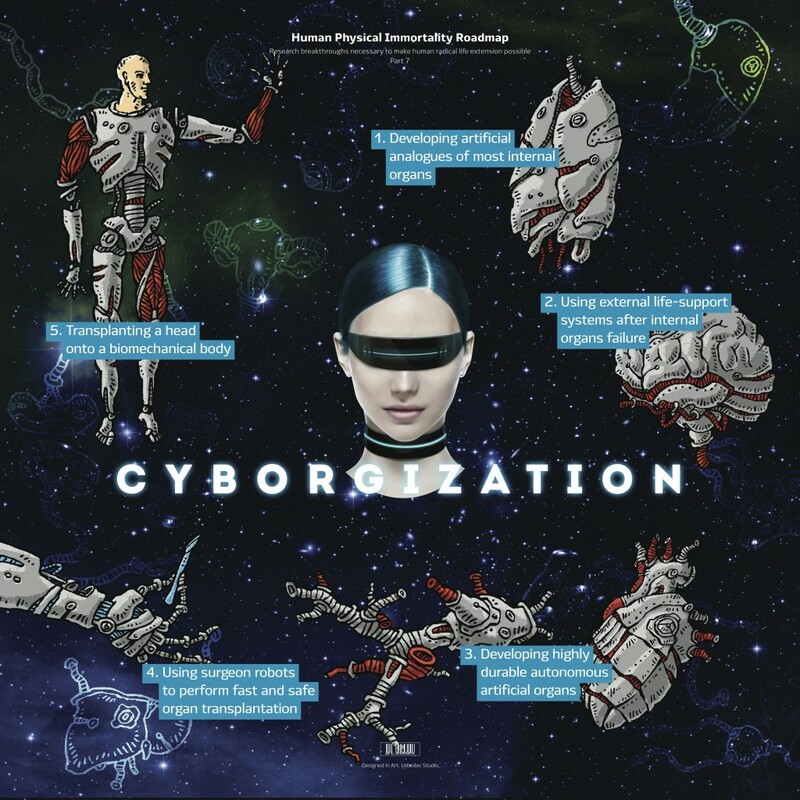 We could end up like star-trek with replicators living in abundance, or as grey-goo. 5. Artificial Intelligence is basically the point where our computers become smarter / faster / better at calculating than the humans who created them. When computers can code themselves, and can do it better than us, we lose our importance in the system. We would have created a new life – an artificial intelligence, which would essentially be a new life-form, with humanity being its creator. They can help us, be ambivalent, or maybe they just have no concept of any of the things we’re worried about. Money? for what? AI doesn’t need food, water or shelter. They can’t be destroyed. I think the key is what will their motivations be? The psychology of AI is an interesting concept – what will drive them? Simply optimizing numbers? What does this mean for humans? Will we be out-optimized? Will we need to leave the system? 6. 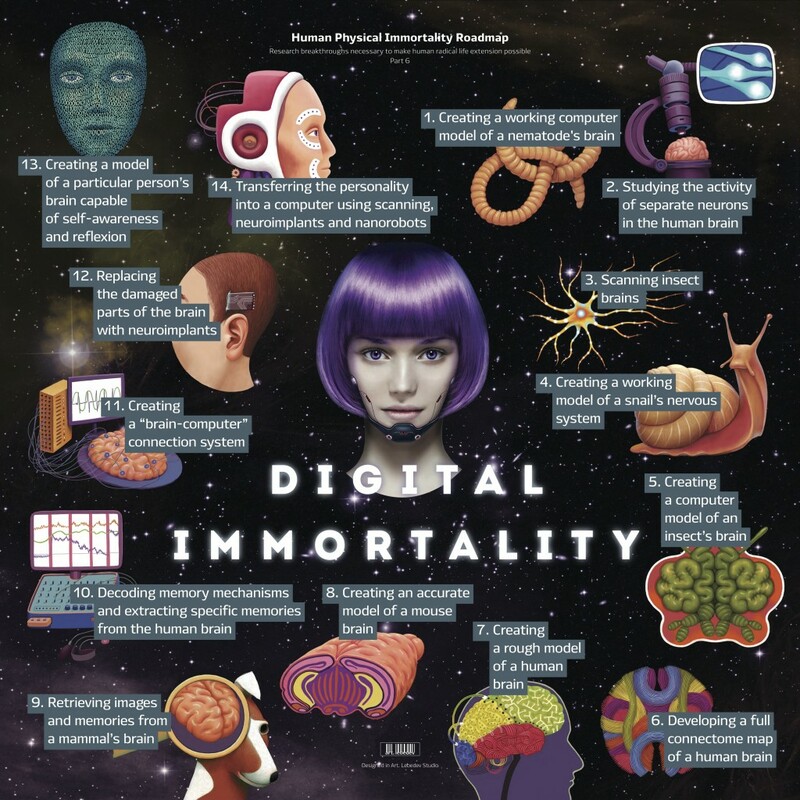 Digital Immortality will happen once we’re able to track the neuron process in the human brain. Imagine an implant when you’re born. It tracks all the neuron impulses in your brain from birth until *death(1)*. Basically all your experiences, all your thoughts, everything, would be stored (and encrypted, hopefully). When you die the first time, you would simply get a new body, and all of your experiences would be uploaded to it. New body, same thoughts – new you? Maybe. At this point, we would also probably have a collective-conscious, where you wouldn’t need a physical body, but could live on ‘the wire’. I think there are too many, you are missing the underlining two types Cybernetics and Genetics. or complete and total oneness within divinity based on unifying like belief systems, becoming creator spawn. death in general is only a product of fear a belief taught to you at birth, born into sin, fear tells the creator no you don’t love me even though you made me with your own hands and make my every move even when I am unconscious of you, but within consciousness of one we can be unified in peace and harmony We has decided this time is now and that heaven and “rapture” are soon at hand for some, for others there is still time, forever to be exact, the game is everlasting for those who don’t seek enlightenment in The Word. Sound, vibration, matter, its the Word of the creator. We are nothing more than Vessels of the Potter and our relationship to that unity is the Cure to fear and death among other terrible curses of the deceiver. A spirit sent here to filter out the seed from the chaff. Time to get deep. Learn to swim. Believe, get a little crazy, take the negatives out of your current understandings altogether. to be immortal sounds a cruel fate for any that desire to see what is beyond life. life is a fleeting moment. death is forever, but what is beyond that? we don’t know, and those who claim to know are religious so I dismiss those. I myself am a Christian. I believe in God and pray with complete belief that if he says its so it is that. sometimes I wonder if there is a life after this one but if he wanted me to know he would let me see it. In the mean time I will Work, survive, and bend my knee in my home on the seventh day.